Each pair of these Wesco Motor Patrol boots is custom built to your size and specifications. They are not kept in stock. Current production time is about 14 weeks . Leather Lining - Heavy 4 Oz. Leather: You can specify black, tan/buckskin, brown, tobacco or platinum. Extra ¼ inch / 6mm thick leather or EVA rubber midsole. Leather is stiffer, EVA rubber is more flexible and lighter. Many buckle colors and styles to choose from. The Motor Patrol Boot's sleek lines and dress instep give it a neat, clean appearance which make it appropriate for wear with uniform breeches. But inside it still has the heart and sole of a Wesco boot. It is sturdy, weather resistant and comfortable. 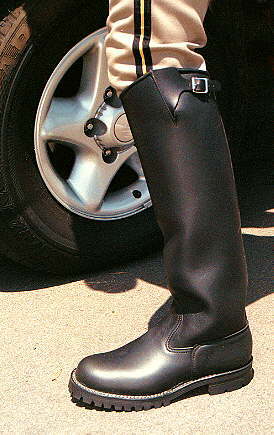 This is a heavy duty motor patrol boot with a dressy appearance. 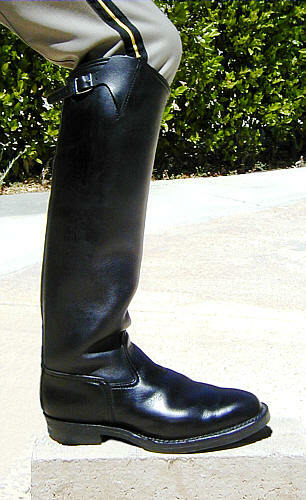 If you prefer a dress boot made with thinner leather, please check out our Dehner motor patrol boots. 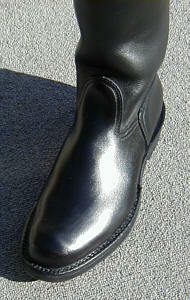 This high quality motorcycle patrol boot is always custom made to your size and specifications. But you don't need a motorcycle or a horse to enjoy these boots. They look great with a pair of your favorite jeans neatly tucked in. It's possible to wear jeans over these boots, but we'd better not hear about it! We recommend having this boot made of Black Tie Domain leather.s This leather is smooth and supple and comes new with a satin silky finish. It easily takes a great shine. The picture at the top of this page, shows a Wesco Motor Patrol boot which has been worn and polished. Most of the other pictures show how the boots look fresh from the bootmaker, before polishing. WESCO builds these boots on lasts expressly designed for producing high quality dress boots with low heels - ½ inch lower than the standard Wesco Boss logger heel. The toe is clean and dressy while the heel is straight and low. 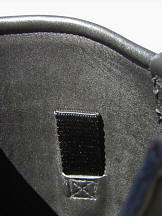 The top has a classic Spanish top which sweeps upward on the outside of the boot. 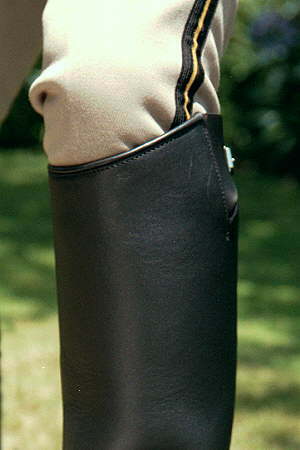 The entire boot is lined in thick 4.5 Ounce Black Leather. This makes the foot area smooth, supple and comfortable while the shaft maintains its smooth, classic shape. The combination of the heavy leather and stitchdown construction makes this boot sturdier and more water resistant than traditional motor patrol and equestrian boots. Wesco designed these boots for motor patrol units in the Pacific Northwest of the US where it is often cool and wet. The boot foot and shaft are lined by a smooth inner leather layer which contributes to the strength and comfort of the boot. This extra layer of leather complements the careful fit and excellent arch support. The boot's comfort is further enhanced by a cushioned foot liner like those found in athletic shoes. Our new customers are often surprised when they discover how comfortable these sturdy boots are! Our sizing advice assumes that you wear boot socks with these boots. Wesco boots normally run true to your US Men's size, however, these motor patrol boots are normally made on a dress last with a "V" shaped dress toe instead of the usual Wesco round toe. Because of this, these boots run about a half size or more large in length. 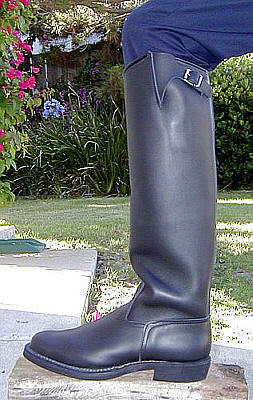 So a size 10 D Wesco Motor Patrol boot made with the dress toe will feel like a size 10½ D Wesco Boss engineer boot. Maybe even a bit larger. Our advice is to go down one half size or more from your actual foot measurement. Of course, if you choose the option for the round toe (like the Wesco Boss engineer boots) then these boots will fit true to size. If you need sizes outside of those available for these boots, we suggest you order them with the optional round toe last which is used in the Wesco Boss engineer boots. The round toe last last fits true to size. Many of our customers prefer this round toe last for its extra toe room. This table shows the U.S. men's size range for the Wesco Motor Patrol boots made with the standard, dressy "V" shaped toe. Boots made with this last are not quite true to size. They are about ½ size larger than specified. So, if your feet are US men's size 10½ you should order these boots in size 10. This table shows the U.S. men's size range for Wesco Motor Patrol boots made with the optional round toe last which is used for the Wesco Jobmaster, Highliner, Boss and Firestormer boots. This last fits true to size. You should order boots made with this last in the same size as your foot. at front and outer side. Take me to the secure order form for these boots. This table shows the maximum calf measurement for each size of Wesco boots in Inches and centimeters. Calf size is the circumference of the largest part of your lower leg measured over breeches or pants. This is largest size calf which will fit in this size boot. If your calf is larger than the dimension in the table, please let us know by putting a note in the special instructions part of the order form. We can have the shaft made larger or smaller up to 1" / 2.5 cm. If your heel measurement is larger than the calf size, your foot is too large to fit into the boot. Our sizing advice assumes that you wear boot socks with these boots. First, determine your foot size. Wesco boots normally run true to your US Men's size, however, these motor patrol boots are made on a dress last with a "V" shaped toe instead of the usual round toe. You'll find that these motor patrol boots fit more snugly in the sides of the toe area because the dress last which is used for these boots has a narrower toe profile than other Wesco boots. The boot toes are also proportionally longer for an equivalent size because they are less round and more pointed in shape. This means that these boots tend to fit slightly more loosely in length than the other Wesco boots. Because of this, these boots run about a half size or more large. So a size 10 D Wesco Motor Patrol boot will feel like a size 10½ D Wesco Boss engineer boot. Maybe even a bit larger. And, because of the nature of "V" shaped toes, you can order a full size lower than your actual size with no fear of your toes hitting the end of the boot... they'll just be squeezed in a bit more on the sides. Click here to go to the page which shows how to measure your foot to determine its true US Men's size and width. Enter the table with the boot size and note the maximum calf measurement for that size boot. See below for instruction on measuring the calf size. 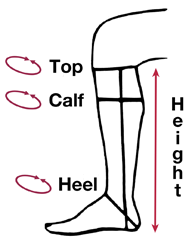 Measure your calves to ensure that they will fit the shaft. This should be done while seated. 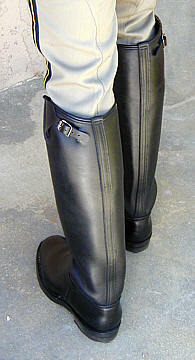 If you will be wearing pants tucked into the boots (best way to wear our boots! 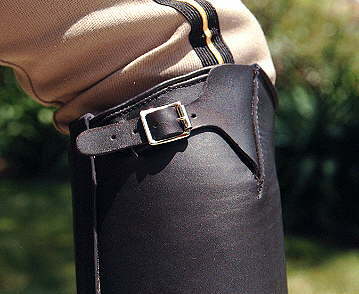 ), you should wear the pants or breeches you plan to wear with the boots and measure over the pants. You will need a measuring tape or you can use a piece of string then measure the length of the string with a ruler. Wrap the tape around the largest part of your lower leg (the calf). The tape should be comfortably snug but not tight. If this calf measurement exceeds the measurement in the table for your size, the standard boot shafts will be too tight for your leg to fit into the boots. In that case, let us know on the order form that you need larger boot shafts and include the calf circumference measurement. 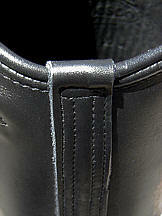 Wesco's bootmakers can add or delete up to 1 inch (2.54 cm) in ¼ inch increments. If you need more than one inch added or removed then we and Wesco recommend that you have the boots custom made to your specific measurements. Wesco has a one time charge to adjust the size of the boot shafts on custom Boss Engineer boots, harness boots and motor patrol boots. Once they've made a leg pattern for you, they keep the pattern on file. On subsequent orders they can adjust the boot shaft size without charging extra. The shafts of these boots will NOT stretch as they break in... so if the boots are too tight in the legs, your calf muscles will be cramped. However, competent boot repair shops can stretch these boot shafts if necessary. The point is that the shafts are stronger than your calf muscle so mechanical help is needed to stretch them. Next, check the height you selected to determine where the top of the boot will be on your leg. Measure up from the heel of your stockinged feet along the back of your leg. This should be done while in a seated position with the knee bent at a 90° angle. The back of the top of the boot will be at the position you measured (or a bit higher.. see note below) and the outside of the boot top will be a bit higher since the Spanish Top sweeps up on the outside. As they break in, these leather lined boots will stay very close to their initial height. Wesco warns that the initial height of Wesco pull-on boots, out of the box, can vary ±1" (±2.54 cm) from the specified height. In our experience, there's a high probability that the boots will end up slightly higher than specified. We have not seen any which were lower. So, for example, if you've specified 20" boots with the expectation that they will be just at the bend in your knee after they are broken in, they could be up to an inch too high. So it's better to get your boots a bit under the maximum possible height. And, if the top is a bit below your knee, your breeches will be less likely to bunch just above the boot top as your legs flex at the knee. Finally, measure around your heel as shown in the diagram. This measurement should not exceed the calf measurement from the table or your foot would not fit through the shaft when you pull the boots on.